Through all the years of our travels in Italy, we kept in mind the extraordinary emotions we had experienced during our first visit to Monghidoro with our friend George DeLuca. His tales of the war, the Alpini troops, and the battles they had fought side-by-side against the Nazis gave us a different perspective of many places we visited. 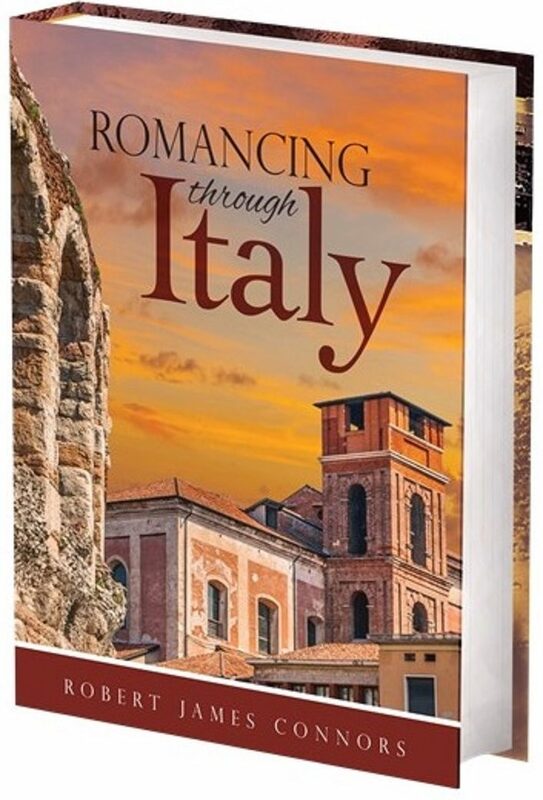 The long drives along the length of Italy made us ever more cognizant of the fact that George had walked most of the way, often under the threat of enemy fire. We continued to seek out details of his story. The countryside of Lazio offers a shady respite from the crush of the city of Rome, and we were enticed to explore its now-peaceful corners. Several ancient volcanic craters now hold beautiful lakes, their shores strung with scenic villages. Fishermen ply the waters, bringing their flopping catches to local markets that offer the freshest and best of local produce. Along the shores of the Mare Tyrrhenia, nice beaches attract tourists and locals alike to bathe in the clear and normally placid waters. At some points, surfers rush to take advantage of waves generated by occasional storms. Eventually we decided it was time to explore one of the promised destinations on our list. Moving along at posted autostrada speeds, and struggling to match the furious pace of traffic, we headed down the Tyrrhenian coast toward our next stop, our rendezvous with historic Cassino. The coastal plain we traversed was mostly flat, but that simply added to the drama of the ancient and decaying volcanic cones we passed, and the brooding heights of the Appenini to our left. The sun beat down upon their dark folds, revealing villages teetering high above the thin threads of roadways that rose toward them. By afternoon, we were driving into Cassino, following a broad divided boulevard that passed a couple of modern hotels. We drove into the shadow of the sheer bulk of Monte Cassino far above, and entered the narrower streets of a bustling city abuzz with life, moving with the familiar flow of city buses, private cars, motorcycles and scooters toward the centro storico, the historic center. After wandering lost around several city blocks without finding a hotel, making convenient right turns when in doubt, we decided to return to one of the establishments we had passed entering town. It was a fortunate choice, and led to one of the most poignant moments of our trip. While walking to our elevator for the ride to our fourth-floor room we passed an expanse of wall that was covered with photographs, many obviously very old. Prominently featured were several of the landmark abbey on the mountain that was the pride of the city. Among the military insignia displayed was the familiar blue emblem of the US Army’s Blue Devils, George DeLuca’s own. His stories of war experiences were about to come to life in a way we didn’t anticipate. Italy had become embroiled in the war due to the maniacal visions of Il Duce, Benito Mussolini. Sharply divided politically, the far-right politics of Mussolini’s Fascist movement had crushed his Italian opposition before his pact with Hitler had brought Italy into the fight for Europe. George and the men of the 88th comprised the first completely new division created within the U.S. Army as the threat of war grew in 1940. They had been through basic training, but landed quite green in Casablanca, Morocco, in December of 1943. North Africa had already been the scene of fierce fighting, but the forces of Germany and Fascist Italy had been driven out a few months earlier after three years of hard fighting. The Blue Devils were still not in the war, which had moved to Sicily in July, and most of George’s fellows wanted to see some action before the war was over. They were soon transferred to Algeria for months of hard training instead. They were trailing behind the action, and their invasion of Italy would have to wait. Yet even as the Allied armies were plotting their invasion, they were communicating with the opposition. Mafia bosses in America stayed in touch with Sicily, and helped guarantee only light opposition there. With that defeat, public opinion turned against the Fascists, and Mussolini was ousted. The Italian Army had stopped fighting after an Armistice was signed on September 3, 1943, but German troops poured south to maintain control and Italy became yet another German-occupied nation. Only a few weeks later the new liberal Italian government declared war on Germany. Thousands of Italian soldiers, including most of the Alpini, took up the fight against the occupiers, and began working with the Allies. After a year of service in the heat of the desert, George’s 351st Regiment moved at last to frigid Napoli, arriving on the 6th of February, 1944. The D-day invasion of Normandy was still four months in the future. Only in Italy were Allied armies facing the might of Germany’s feared legions. The Blue Devils were soon rejoined by their brother regiments of the 349th and 350th. After a few nervous weeks of waiting, they were moved forward to join the line before Monte Cassino. The mountain was the rock that anchored the western end of the the Germans’ Gustav Line, heavy fortifications intended to keep the Allies contained in southern Italy. George and his battalion were assigned to positions at the foot of Monte Cassino, the mountain itself. Posted to defend Hill 706, they were close to the German defenders above. The mountain appears from the city of Cassino as an almost monolithic upthrust, with extremely steep slopes. Only by following a narrow, snaking road can one normally reach the summit, which stands some 480 meters above the town. During the war, it was only by crawling that a man could approach it without being killed. No longer lagging behind, the 88th was now the point of the American spear. The day they arrived George’s unit took its first combat casualties. At the top of the mountain above them was the Abbey of Monte Cassino. With its large complex of buildings, some dating back 2,000 years, it was a national treasure. Full of priceless religious works and golden artifacts, it housed a population of monks. Generals had long argued about the famed abbey, high on the ridge above the battle ground. Were the Germans using it for an observation post to watch Allied movements? Could it, should it be a target? Or was it too important, a world treasure that should be spared? In the end those who wanted it destroyed won the debate, and on February 15, 1944, waves of Allied bombers had reduced the history and riches to rubble and dust. George had watched the destruction from below. The artillery unit assigned to their battle group was directed to shell the southeast corner of the abbey, already reduced to broken stone. It was believed that German artillery spotters had taken positions there. Ironically, the destroyed buildings made excellent hiding places, and offered good protection from the cannonade. Allied armies spent weeks attempting to break through the German lines, but their flanks were defended by the mountains and swift rivers. Heavy artillery rained down upon them daily from the heights, and German snipers took their toll. The Allies made several unsuccessful frontal attacks against the steep flanks of the mountain, but slowly, ground was gained. The price was high. The battle, we knew, had been long and bloody, and the Germans had successfully stalled the Allies’ northward march. It was there at Cassino that George lost several of the guys he’d been serving with for more than a year. Good friends. Despite the training, it was a tough adjustment for many formerly peaceful men, accepting that now it was kill or be killed. They became true soldiers. “We served alongside a British company,” he had told me once when he was in the mood to share stories. “Every afternoon, no matter how bad the shelling and the snipers, they would stop to take tea. They built fires, which gave away their position with the smoke. We told them not to, but they insisted on taking tea.” He shook his head sadly. Ironically, after the bombing of the abbey, the Germans had mounted a stubborn resistance from the rubble, which provided an outstanding defensive position. It was only the fierce and sustained attack of the Free Polish Army that had finally liberated the Abbey at a heavy cost. Their hatred for the Nazis who had crushed their homeland was said to have struck terror in the hearts of the defenders. Cassino held a wealth of history that we were eager to explore. I returned to the lobby and stood and studied the wall of photos, including those showing the magnificence of the abbey before the war and the rubble that remained afterward. As I stood there, a solidly-built but elderly Italian man approached, and commented on the photos. “Lei piace?” Do you like them? he asked, and I told him I did, although many of the photos also showed the ravages of war, the destruction wrought by Allied bombs, the months of combat, shells and grenades. He told me his family owned the hotel we had chosen, and that he still worked a bit helping out. Gazing at the photos, he began to describe the events of the war, which he had experienced as a child. He spoke of how many city residents, including his two brothers and much of his family, had fled the tanks and guns to take refuge in the abbey. Everyone believed it was sacred, a church which would never be attacked. There were no Germans there, he assured me, only monks and refugees. “L’Inglese,” he said, the English, did this, and he still blamed them for the act. He was correct in that British commanders had argued in favor of the bombing, but I knew that our United States Army Air Forces dropped many of the bombs, and shared in the blame. We stood there together for a long moment in silence, contemplating the horrors depicted in the photos. Something needed to be said. Something completely inadequate, I knew, but something… meaningful. Words sometimes fail to express what we are thinking. He looked at me a moment, as if in recognition. His eyes were still wet with tears, but he nodded, shook my hand, offered a faint smile, and slowly walked away. My thoughts that night were of both the wonder and majesties of life, and the tragedies which we too often bring upon ourselves.